Installs on the top of the printer. This unit supports up to 500 sheets of paper (20 lb., 75 gsm). Envelopes, transparencies, card stock and labels are also supported with this unit. Up to 3 Output Expanders may be supported at a time. Any combination of Output Expander and 4-Bin Mailbox for up to a total of 3 devices may be configured. When both an Output Expander and High Capacity Output Expander are installed, the Output Expander must be installed above the High Capacity Output Expander. The Output Expander supports bin 'full' sensing. When both an Output Expander and High Capacity Output Expander are installed, the Output Expander must be installed above the High Capacity Output Expander. The Output Expander supports bin 'full' sensing. 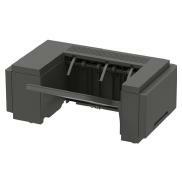 This unit supports up to 500 sheets of paper (20 lb., 75 gsm). Envelopes, transparencies, card stock and labels are also supported with this unit. Up to 3 Output Expanders may be supported at a time. Any combination of Output Expander and 4-Bin Mailbox for up to a total of 3 devices may be configured.